Advancements in technology including behavioral analytics, machine learning, and big data are enabling firms to holistically analyze data and adopt a risk based approach to surveillance. But, Enhanced Surveillance programs and determining which technologies to use can be overwhelming to say the least — especially with constant budgetary pressures. 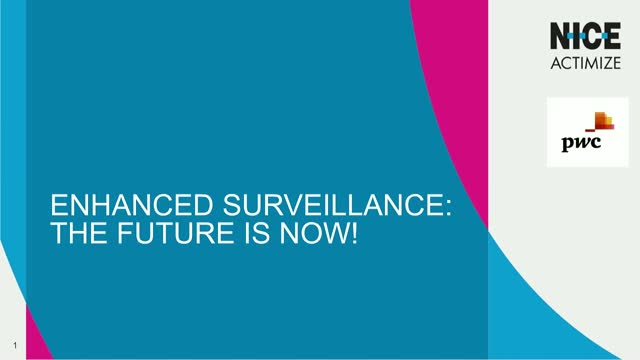 Compliance experts from PWC and NICE Actimize are joining forces to unpack these new innovations and the impetus behind them to help you overcome the challenges associated with new approaches to surveillance. It’s clear that the strategies financial organizations have taken to address increasing alert volumes has created gaps in operational efficiencies and productivity. And due to increasing regulations and compliance program costs, financial organizations are at a tipping point. Today, financial organizations have an opportunity to intelligently automate their AML program to help realize needed efficiency gains and cost reduction benefits. Achieving consistent regulatory coverage, reducing the cost of compliance, and having an agile operation that can pivot as quickly as today’s market demands remain among the core challenges of our customers. To address these challenges, AML technology needs to be intelligent and autonomous. But what does that mean for financial organizations? Stay Protected. Stay Compliant.Safeguarding your organization against financial crime is critical. How do you assess the risks you face, stay compliant with ever-changing regulations, and keep one step ahead of the criminals? Fight back with NICE Actimize.